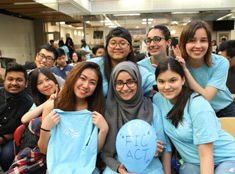 FIC - Get involved at FIC! Our goal is to help you find the opportunities that will help you grow and learn both inside and outside of the classroom. Whether you are interested in building your resume, meeting new friends, or developing leadership skills, there is an opportunity for you! All leadership opportunities and application information is available on the student portal. Who we are: The Community Transition Program provides academic and personal support for FIC's student population. Every semester, it welcomes 300 - 700 new students at FIC Orientation and then provides mentorship for new and current students throughout the semester. We provide the foundation for students to develop a network that will enable them to succeed at FIC. What we do: We run Orientation for new students and then provide semester support for all students through the Peer Advising program. Becoming part of this program gives you the opportunity to be the bridge that connects students to FIC community and familiarizes students with campus resources. 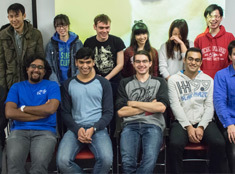 Who we are: The FIC Awareness Campaign Team (FIC ACT) raises awareness surrounding key problems and concerns that occupy student life at FIC and at SFU. What we do: FIC ACT works as a team to promote and deliver an awareness campaign during one week per a semester. The FIC ACT Team will plan, coordinate, and execute the week, focusing on different ways to engage students in different issues. What we do: Peer Education provides one on one nonjudgmental assistance to students over all courses offered at FIC. We create an environment where students feel they are receiving guidance from trusted friends who are able to understand matters from their perspective. Who we are and what we do: We are a small group of tech-savvy FIC alumni who maintain all of FIC’s computers, printers, projectors, and photocopiers while helping staff and students resolve their technical issues. 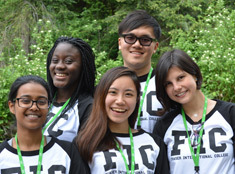 Are you interested in getting involved at FIC but can't commit to a specific program? We are always looking for volunteers with a variety of skill sets for special events at FIC. Some of these events include Graduation, case competitions, mentorship opportunities, and presentations.